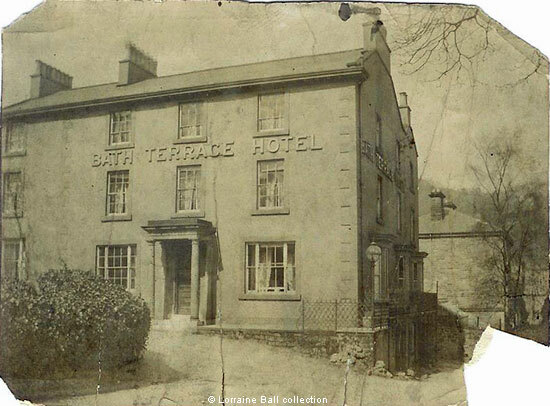 This is the earliest known photograph of the former Bath Terrace Hotel (previously Walker's Hotel) and dates from the time it was run by the Watsons. Robert Watson and his wife Rosetta Jane were relatively newly married when they took over the running of the hotel from Thomas William Hesketh in early 1891. Robert had been a farmer in Scarrington, where he had been born and his father was Lord of the Manor, though it is not clear at present when he began working in the hotel trade. However, Rosetta had experience of the industry. The couple were at the Bath Terrace for approximately three years and three of their five sons, the twins Robert and Thomas Frank and the slightly younger Hugh, were born there and baptised at Holy Trinity. The family then moved to Derby, first to the Derwent Commercial Hotel and later to the Globe Spirits Vaults in Iron Gate. The two younger sons, Edward and John, were born in Derby. Unfortunately, Robert Watson died on 27 Sept., 1899 and the family moved to Kidderminster. The elder sons emigrated to Canada where they had relatives, but the three younger sons remained in England and joined the Army in the First World War. Tragically, all three were killed; Hugh and John are commemorated at the Menin Gate Memorial, and John at Thiepval. Photograph in the collection of and provided by and © Lorraine Ball. Photographer unknown. Written, research provided by and © Ann Andrews. Robert Watson was living at the Bath Terrace Hotel at the time of the 1891 census although Kelly's Directory 1891 shows Mr. Hesketh still at the Hotel. He was living at Scarrington in 1881, running a 165 acre farm. His father was shown as Lord of the Manor there in the History, Gazetteer & Directory of Nottinghamshire, 1885. Rosetta (nee Hall) was working at the Terminus Hotel, Prittlewell in Essex in 1881. License transfer of Bath Terrace Hotel from Robert Watson to Mr Harrison, January 1894 (The Derby Mercury & Ann Andrews' database). Kelly's Directory of Derbyshire, 1895 shows Robert Watson at the Derwent Commercial Hotel, 13 London Road, Derby and Kelly's Directory of Derbyshire, 1899 at the Globe Spirits Vaults. The Derby Mercury, 4 Oct, 1899. Announcement of his death. Also 1901 and 1911 census.